(oops, she’s the anti cherry blossom), but that’s a blog for another time. 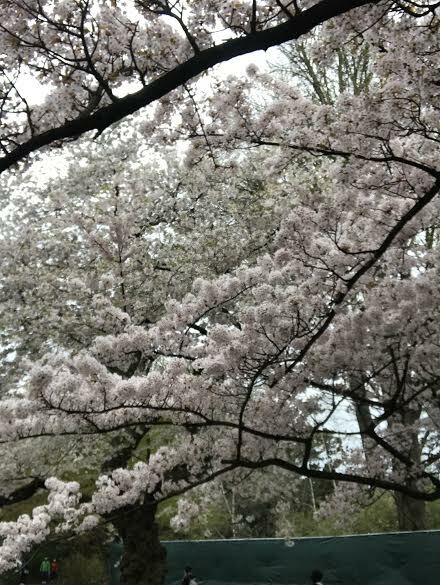 Cherry blossoms bloomed late this year after a cold Monday rain. After the Botanic Garden’s Cosplay fashion show set around lazy unbloomed trees at the Cherry Blossom Festival, part of me wondered if they would ever emerge, staying folded in a dark pink cocoon, hiding from lasting cold. The winter had been brutal. We had to call snowstorms crazy names like bomb cyclones to describe them. The spring had also been cold and slow moving. Maybe the flowers would just stay tight and bloom in June or something and then everything would be thrown off. That’s how, as an insomniac I thought of sleep: a pale blooming flower that refused to open until somewhere around 6:30am, where it would have prematurely withered in the wait. But the withering didn’t happen this year. Nature took its course like it always does and after the rain on Monday, the forgiving Tuesday, May Day, brought late cherry blossoms. But there they were, blooming pink and glorious all over the city like light evening clouds. Cherry blossoms, more than any other flower, are the sign that spring is in full swing. Crocuses and daffodils, snowdrops, and forsythia, are timid and quiet in their blooming. But the burst of pink is quite bold and tempting like walking through a rococo painting without shoes on, the ground a vibrating green and fresh on your soles. When walking through an esplanade of blossoms, the world is quite literally transformed as the pink shades bring out reds, blues, and greens. The cherry blossoms around the city are not from the edible cherry variety, they come from the genus called prunus and can bloom in shades from white to darker pink. The flowers grow throughout Japan, China, and Taiwan, and the northern hemisphere, needing a seasonal shift to produce their growth. Between the time of blossoming to the emergence of leaves there is only about one week. There are dozens of varieties, but the common types include Sakura, which is the national flower of Japan. In Japan there is a tradition of eating below the blooming trees, and the haiku tradition describes flowers and cherry blossoms as one in the same. Also, in Japan the kamikaze fighters used the cherry blossom as a sign of nationalism, abundance, and fragility. Often the flowers were painted on the sides of their planes before a fatal mission. Whatever their significance, towards nirvana, or summer, the blossoms are an initiation. Because just like clouds they pass, and while the other summer flowers bloom, craning their necks: the hearty roses and foxgloves, the lilies, and the asters, the daisies, there is nothing so fresh as a cherry blossom grove turning a world into a snow globe of petals, arranging themselves like fervent pink bees to sweet flowers, and their momentary crowning to a long and warm summer ahead.